I am very excited to get this interview out for everyone since it was done with Erick of Oblivion Haunted House which is a new haunt that starts this year and I was able to get some amazing feedback from someone going through the start-up process currently and I think you will love what he had to say. 1 – What sort of obstacles have you encountered so far in starting a new professional haunt and how did you overcome them? I have been insanely lucky and blessed with an amazing crew. We have crossed some issues with outdoor set ups at our location, IE outdoor temporary façade plans, billboards on the side of the building, etc – but it’s all about the attitude and possible compromise. The important thing to remember is not to get mad. We approach every officials ‘decision’ with a ‘thank you’ and understanding, whether it’s thanking them for permission or thanking them for their consideration, and questioning if they would be willing to compromise. These people hold your event in their hands. That’s the biggest thing to remember. 2 – You stated in the Haunt World Forum that you had a budget under $20,000 for your first year which is small for a new haunt your size, what are some tips for others starting out with small budgets. Outside of the structure, advertisement, website design, hosting, etc – all construction and props have been purchased and completed on a $9,000 dollar budget. Crazy. I know. Luckily, my crew all works full time in professional live theatre, whether it be construction and fabrication, lighting or tickets and marketing. I myself am a production designer for many local theatre groups throughout Wisconsin. We decided to bring it back to basics. We knew we could build, detail (paint) and light the heck out of the show. We started with a general idea of ‘themes’ we wanted to incorporate but didn’t design and rooms. We had our layout down, room breakups and areas (or themes) separated. We then designed and built all of our rooms when we found free items of ‘inspiration.’ It has worked out very well. There are so many resources for FREE STUFF out there and we have hit every one of them. We take all of the local thrift stores rejects, peruse craigslist’s ‘free’ category and post ‘wanted’ ads on craigslist for specialty items we are looking for. We also learned that paint stores need to pay to dispose of miss-tinted paints. We get all the miss-tinted paints as long as we take it all. The only issue we have run into with this is obtaining the MSDS forms for the free paint, but other than that – FREE PAINT! If you walk through our haunt, you will find we try not to buy black paint. We use the free paint from the paint company and mix up all the dark colors which usually turns out dark green or brown. I figure – it doesn’t have to be true black in the dark as long as we are saving money! 3 – What aspect of starting a new haunt business do you consider to be the most important to the success of the new haunt? Safety. The first thing we did was pitch the safety to the city and officials before anything else. We had a EAP in place and ready to go. We even brought a sample of the flame retardant product we would use with us. They knew that we were not messing around and that we knew our stuff. I have found that it has made them more willing to compromise in the end. For us personally, the most important aspect is the quality of the show in full. We wanted to be the cheapest, longest, single most entertaining event in the area. With that said we have created MULTIPLE areas for actors and crazy detailed scenes so that the show never gets old for our patrons or our actors. 4 – Have you encountered any problems with working with local regulations and officials and what are some of the more important things they focus on when inspecting or reviewing your haunt? 5 – You mention the scare being the most important part and that it will be the major focus for the first year, how are you working this with your actors? Have you already run casting calls and do you plan to do any training? Are there any other suggestions or tips you are using for the scares you would like to share? Being in the theatre, we have many contacts for stage actors, but most of them have no haunt experience. We have chosen themes with wide variety of choices for character and improvisational opportunities. We also have about 300 local students and community individuals signed up and interested in acting for us. We plan on having a general meeting in September, along with a ‘Ghoul School’ to see what they’ve got. We will then pack the haunt with all the interested individuals for a ‘dry tech’ (as it’s called in theatre world.) My philosophy is that costumes and makeup do not make you scary. They enhance the scare factor. For our dry tech we will have no costumes and no makeup, just actors placed in the house with full show lighting and sound to see how they do. We will hand pick our crew out of that bunch. 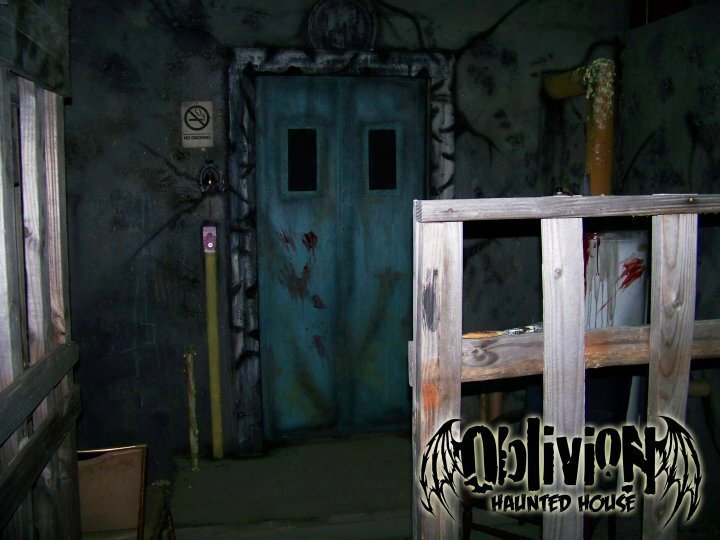 6 – In your 16 years of haunt experience where did you pick up the most of what you have learned? Did you attend any training or theater groups? Any suggestions to future haunters on learning the ways of haunting? I hope you enjoyed the interview and got some useful information from the feedback Erick gave us on what he has gone through so far in starting a new professional haunted house. I hope to do another interview with him in the future and make sure you make it over to their website at http://www.oblivionhauntedhouse.com/ and if your in the area or not make sure you get out there to check out their amazing new haunt.